Udupi, August 15, 2018: A protest was staged at Gerukatte in Perampalli by locals along with family members and relatives of a Dalit youth who died allegedly due to negligence of the Udupi District Government Hospital authorities. Bhasker (36), son of Narsi and late Gopal couple was taken to the Udupi Government Hospital two days ago for kidney related ailment. The doctor who said he had no such problem had prescribed some medicines. However, the condition of Bhaker had worsened on Tuesday following which he was admtited to the district hospital. Stating that the hospital lacked amenities the doctors had asked the family to take the patient to Wenlock. But, when Wenlock authorities said there was no vacant bed in ICU the patient was taken to Manipal Hospital, However he died on way, said Bhasker’s brother Nagaraj. 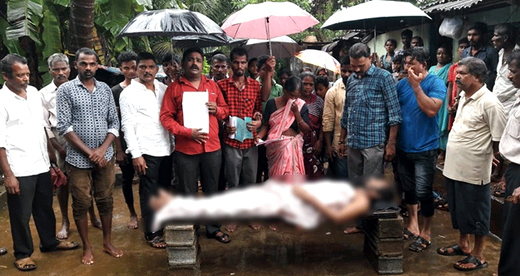 The body was kept in front of Bhasker’s house as part of the protest and compensation was demanded to the bereaved family. The protestors also demanded investigation by the DC with regard to the alleged negligence of the District Hospital. The deceased Bhasker’s brother Harish too had died of a similar ailment two years ago. How sad? The doctors are least concerned about the patient these days , who is responsible for this and can he be brought back to life ?